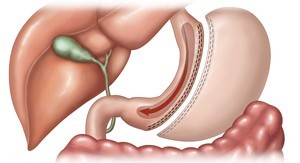 The Gastric Sleeve / Sleeve Gastrectomy procedure is a restrictive procedure that by creating a smaller stomach pouch, limits the amount of food that can be eaten at any one time. You feel full sooner and stay full longer. As you eat less food the body will stop storing excess calories and start using its fat supply for energy. In addition by removing a part of the stomach we eliminate a portion of the hunger hormone Grehlin which causes a decrease in appetite. Food passes through the digestive tract in the usual order allowing for normal digestion. Dr. Bernie Hanna will perform a thorough pre-surgical consultation to determine whether you are a candidate for Gastric Sleeve surgery. He will evaluate your BMI, your overall health and any medications you are taking, as well as your weight loss needs and goals. Based on this information, he will tell you whether you are a candidate for surgery and whether this procedure or another weight loss procedure would be your best choice. n addition to Gastric Sleeve surgery, Dr. Hanna also performs Lap-Band, gastric bypass and revision weight loss surgery procedures. If you would like to learn more about these treatments and how they compare, contact Dr. Bernie Hanna today by calling (702) 384-1160 or by clicking here. Sleeve Surgery is low maintenance with less long term overall problems. High degree of success and fast weight loss, combined with low rate of side effects. It’s a 30 to 45 minute procedure. Same day surgery so you go home several hrs after your procedure. How is it different from Gastric Band or Bypass? here is no foreign body like in Gastric Band surgery. The normal digestive tract remains. No maintenance, only follow up with your surgeon and dietitian. It’s outpatient surgery or one overnight stay. You should be up and walking within a few hours after surgery.